I’m constantly trying to accomplish a few things. 1.) Use what I have on hand without going to the store, 2.) Have something quick and easy that will feed the entire family for supper, 3.) Do as few dishes as possible and 4. )﻿ Spend as much time in the evenings as a family doing fun things now that it’s gotten busier. 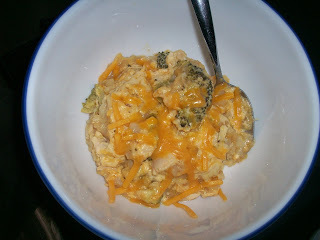 This crock pot chicken, broccoli and cheese tater tot casserole helps to accomplish all of those things. It’s truly a one pot wonder that makes all of my listed accomplishments possible. Mix the soup, milk and seasoning in a large mixing bowl. 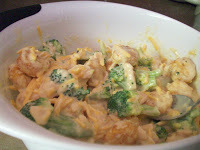 Add 2 cups of the cheese, the chicken and broccoli and stir to incorporate. You can now add the ﻿tater tots and stir. Make sure that all the tater tots are coated with the mixture and incorporated well. 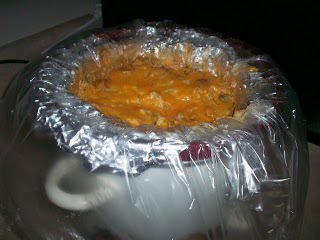 Line a 3 – 4 quart crock pot with aluminum foil. Just because this has a lot of cheese and I wanted an easy clean up I also used a slow cooker liner. Pour the mixture into the lined crock pot. Place folded paper towels on top of the crock pot and secure with the lid. 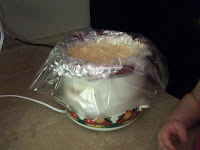 This will keep the extra condensation from the lid during the cooking process from watering down the dish. Cook on low for 5 – 6 hours or on high for 3 – 3 1/2 hours. Around 15 – 30 minutes before the end of cook time sprinkle the remaining cheese evenly over the top. This will melt the cheese nicely. If you turn the crock pot off and remove the crockery (if yours has a removable crock) the casserole will start to cool down and set faster. It stinks when someone burns their tongue and/ or roof of their mouth (jus’ sayin’). Serve with your favorite veggie or side salad. It can even be served alone. NOTE: You could substitute ingredients easily for this casserole. You could use a cheddar cheese soup or your families favorite ‘cream of” soup in place of the cream of chicken. You could also use chopped broccoli instead of florets. For that matter you could use green beans or even mixed veggies. If you have leftover rotisserie chicken, grilled chicken or baked chicken you could use 1 1/3 cups of it cut into bite sized pieces in place of the canned chicken. It’s also very important that you use the canned evaporated milk. Since different models of slow cookers run at different temperatures you don’t want to chance using real milk and it curdling. 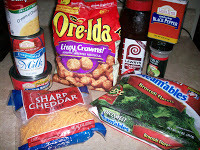 See Crock Pot Chicken, Broccoli & Cheese Tater Tot Casserole on Key Ingredient. This recipe shared at Prairie Story, Foodie Friday and Melt In Your Mouth Monday.